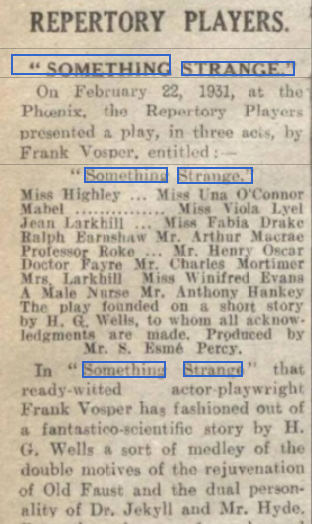 Charles Mortimer was in the cast of "Something Strange", at the Phoenix Theatre, London, on 22 March, 1931. He played Dr Fayre. From the Era 25 February, 1931. The Repertory Players Product ion. 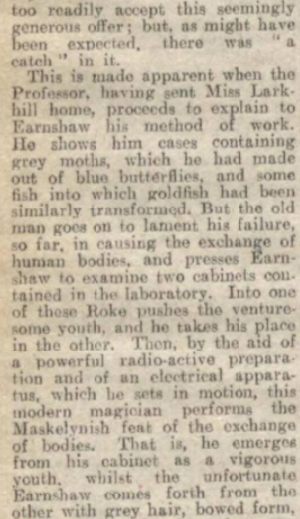 A Play in three acts, by Frank Vosper, founded on a short story by H. G. Wells. 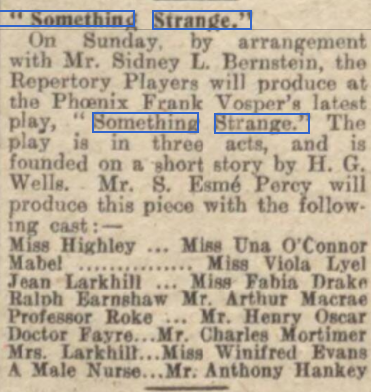 Produced by the Repertory Players at the Theatre on Sunday, February 22nd, 1931. This is the story of a villainous old scientist whose love of the world and the flesh dies hard. He inveigles a healthy young man to his study and there, by means of a devilish contrivance which he has invented, changes identities with him. 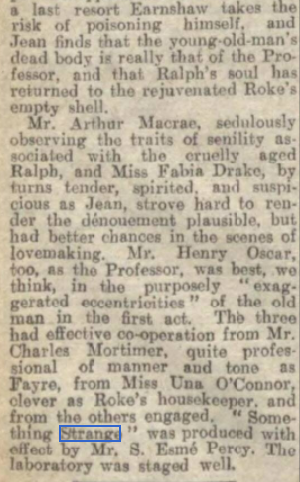 The old man, in the body of the young one, then enjoys the pleasures of a second youth, while the boy, condemned to a prison of wrinkled skin, , and realising that his elderly rival is making love to his fiancee, is driven frantic with horror, and sent to a mental home. 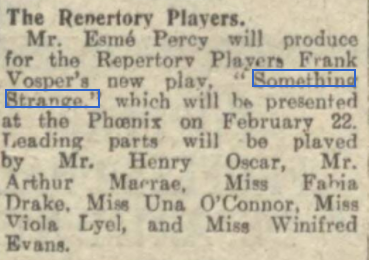 It is an excellent idea, and if it does not come off in the theatre, this is due first to some slovenliness in Mr. Vosper's playwriting, and secondly Mr. Henry Oscar's complete misreading of his part. Mr Vosper wastes too much time by telling his audience what they know already, and he is over fond of filling in gaps in the action with inconsequent feminine garrulities. Mr. Oscar did not give the necessary sinister qualities to the scientist, and played him as if he were just a jolly, eccentric old gentleman. Consequently the first act, which should have been pregnant with horror, failed to move us. And later he did not for a moment suggest a youthful spirit captive in senile body. Mr. Arthur Macrae, as the boy, was excellent, and in his acting did accomplish something approaching a metamorphosis of character. 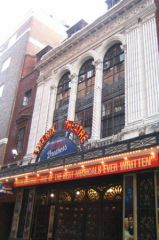 Miss Fabia Drake was sincere and effective as the fiancee, and Miss Una O’Connnor's shrill ditherings as a spinsterish housekeeper were cleverly done. 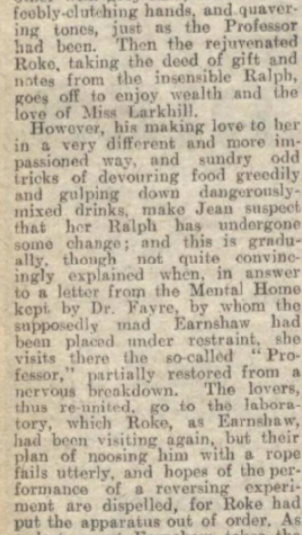 The rest were given few chances, but Mr. Charles Mortimer's mental specialist, might have looked little more like a doctor and a little less like a butler. From The Stage - Thursday 19 February 1931. 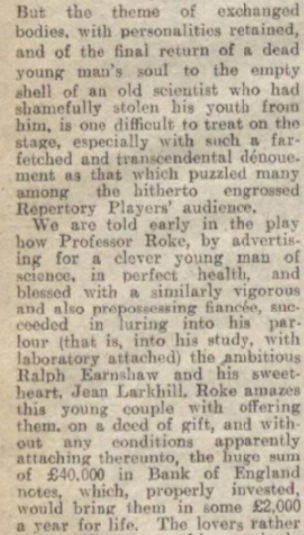 From The Stage - Thursday 05 February 1931.